This post has been rewritten and is being updated. The link for the spreadsheet has changed, so if your link doesn't work, that's why. All things in conspiracy world seem ridiculous to the ignorant. Research before you decide things. 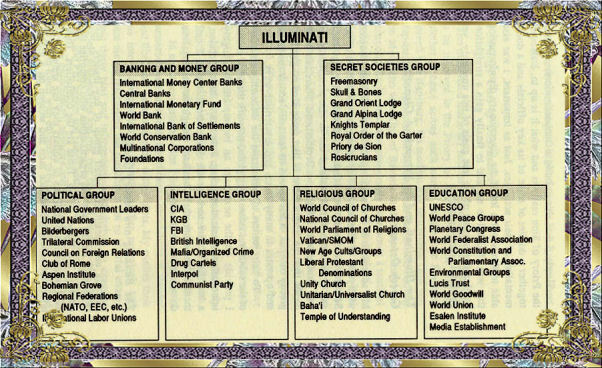 Illuminati & secret societies are considered active and their current existence is fact. They have/had a mass genocide plan called the New World Order in which they plan on exterminating 80-90% of the population on the planet. They have manipulated the entire history of human kind. We're swimming in lies. Mainstream media is not trustworthy. Tv [and other media] is a brainwasher. Media is a censored bunch of packaged lies. Our world is completely different than the illusion most of us see. If you research constantly for a few months, trying to wake yourself up daily, you will eventually see through it all. Elite are everywhere, high and low. 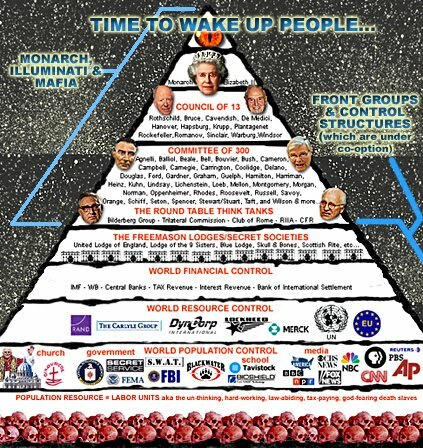 If the leaders of towns weren't corrupt (or "sleeping" & unintentionally corrupt), then people would realize that elite are manipulating us from the top. But if the lies are protected at low levels, they insure people keep sleeping, not aware, not awake. If you think these prelude facts are crazy, sorry, but go back to conspiracy school. Do more research. This is a new link, because the old document was deleted and I don't know what happened. So if you linked directly to the old spreadsheet, the link isn't going to work.. and this is why. Please read my notes before editing, adding to, or sorting it. You do not need to have an account to view/edit it. You also do not need to download it. IF IT'S BLANK: exit and reload. Then email me/comment if it's still blank. It hopefully is just a glitch and has happened a few times. If you want to copy, and then it turns out screwed up & disorganized looking.. Try taking a "print screen picture" or "an embeded pdf you can download from Scribd for your own research" like this person did. It is an spreadsheet of details of elite leaders leaving their posts, the number is at about 1300 right now. It will be updated, the number will go up as I and others research more, and as recent events are documented. This is a link for an excel sheet full of elite arrests, retirements, resignations, impeachments, firings, "forced to quit," jail sentences, charges, arrest warrants, a few important deaths, etc. My primary reason for starting this huge list was to see whether the galactic federation really are/is credible, and I saw this as one way to do that. Over the last two years, they've been claiming that elite are leaving their posts.... and I wasn't seeing proof. Well. I found proof. But, galactic federation "believer" or not, you should really look at this document. It'll open your eyes and leave you questioning... is this normal? so many elite leaving their posts? And what is the galactic federation, and what do they claim/teach? HOW DID I (primary author) KNOW WHO'S ELITE AND WHO'S NOT? I honestly have no way of knowing who's corrupt, bloodline, whatever, or not. I could spend hours researching every single person on the list.... but I'm already spending hours on this. So if you want to add an extra column of why you think they're corrupt or not, or somehow something similar on your own version of the spreadsheet (copied or downloaded to you), be my guest. But really, I think that even if a person doesn't seem corrupt or was very much adored by their organization members or even the public, what people do behind closed doors can be pretty secret- and seems pretty common. So even if a person doesn't seem elite and corrupt, I don't think there's any for sure way of knowing. Having said that, I also think that there are some very obvious and undeniable people/positions on this spreadsheet, such as politicians, CEOs, presidents, and top executives of famous corporations, top journalists & CEOs of media, bankers, corrupt religious leaders, premiers, prime ministers, queens, princesses, cabinets, and those involved with money scandals, phone scandals, swiss banks, pharmaceutical companies, etc. Be aware that many people might just be CEOs, designers, or university deans (etc.) by coincidence, just because they earned that spot and wanted it. They might not be a "dark cabal" or "illuminati" member. And if that is you, and you're on this list, I sincerely apologize. That being said, also keep in mind that MANY of them are dark, seem rather guilty, and are associated with wrongdoings of corporations (if you're haven't woken up to conspiracy theories yet, it would be best to research this). There is no way to know whether a person in a prestige position is "elite" or not. Especially keep in mind that there are MANY elite who have resigned who were connected to banks and governments, investigations, scandals, etc. If you think someone is definitely not elite, go ahead and delete them. Or, maybe this would work better for you- save my document to your computer and make your own list with less or different people. I won't be offended :) Even if you take out people like school principals, whoever... you'll still have an impressive list to prove to yourself and the world. Please keep in mind that elite people are everywhere, and that's how they've maintained control. They are high and low, leading countries, organizations, and yes, towns. I've heard this over and over, and I'm positive about it. The question is figuring out who is "elite" but like I said, there's no way to know for sure. To remind the world about their effective power and manipulation system, I included a few diagrams. Elite have their hands in not just politics, but everywhere, in every kind of institution. Elite are in every area of society, in order to keep everything how they want it. 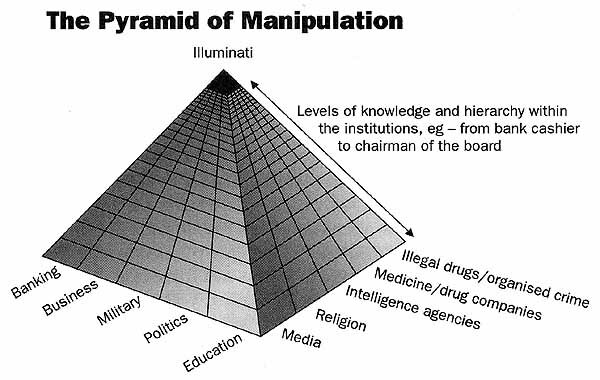 Remember the Illuminati structure of control?